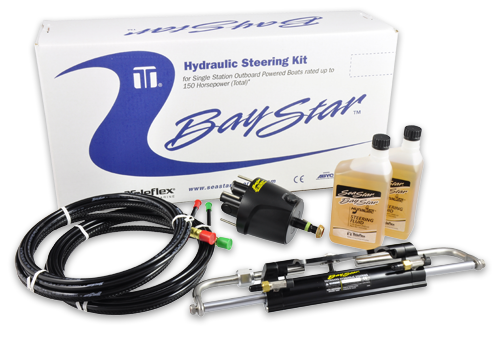 BayStar™˙hydraulic steering is brought to you by the manufacturers of SeaStar®, the most trusted name in pleasure boat steering. BayStar allows you to install all of the safety, reliability and comfort of hydraulic steering onto your boats rated up to MAX. 150HP as rated by the engine manufacturer. Combine this with the superior SeaStar Solutions design team, rigid ISO quality control and teamed with the finest materials and precision manufacturing—BayStar continues the tradition bringing comfort and safety to boating. The BayStar steering system consists of a super low friction helm for smooth comfortable steering, a balanced cylinder–featuring a compact design that fits most splashwells. For your convenience two lengths of 20’ cut to fit tubing are supplies (2 x 20’ length), two bottles of hydraulic steering fluid, and one fill tube for easy fill and purge. BayStar is NOT recommended in applications with high steering effort (i.e. such as those using high performance engines or boats capable of attaining high speeds), customers should consider upgrading the system to SeaStar/SeaStar Pro steering . 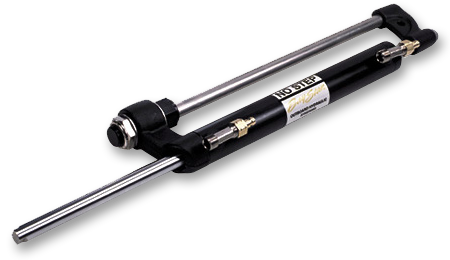 This will reduce the steering effort due to the fact that SeaStar steering provides more output power resulting in lower steering effort. • Patented No FeedBack™ Steering lock valves. • Up to 150 horsepower (total). • Available either as separate components or as a complete system ready to install. • BayStar hydraulic tubing cut to suit application. • Requires 3” (76mm) cut-out hole in dash. • Requires 21” (534mm) splashwell width. DO NOT use BayStar on smaller HP outboard engines that use wing nut type transom mount clamping screws. Tilt Helm HH4315 is available separately. Currently not available in kit form. 2. Engine clamp brackets must be cut or ground, and the engine through bolted onto the transom, or interference will occur, restricting engine trim and tilt. 4. Cylinder HC4645 may be used in these applications. The pivot plate will need to be flipped before installation. Instructions provided with Owner’s Manual. 5. Johnson 115 HP 2-Stroke enginnes, require the pivot plate to be flipped. See Note #4. Super low friction helm for smooth comfortable steering. 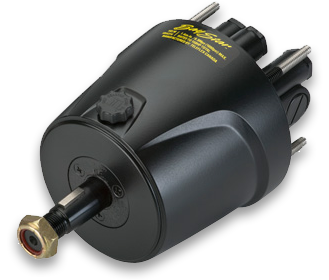 Balanced cylinder, featuring a compact design that fits most splashwells. Balanced cylinder that fits most splashwells. 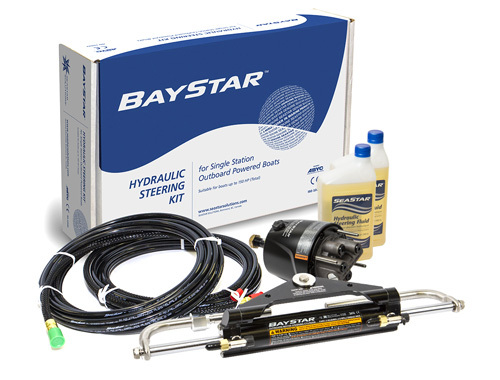 BayStar Steering kits come complete with everything needed for an install, (some engines require spacer kits and/or cylinder plate change, see application chart on page 1-5) the compact cylinder does not require the engine manufacturer drag link for connection. For your convenience two lengths of 20′ cut to fit tubing are supplied with the HK4200A and two lengths of 30′ cut to fit tubing are supplied with the HK4230A kit. HC4645H compact cylinder is included in the BayStar steering kits. This cylinder can be converted to HC4658H by following instructions included with the product. If your engine requires use of a cylinder other than HC4645H or HC4658H, please refer to the figure below for the appropriate replacement pivot plate, which must be purchased separately. Read and understand all related product instructions before performing any work on a hydraulic steering system.